Discussion in 'Project Display' started by snucky, Dec 15, 2011. You need to vent the tub. The tub drain including the trap should be 2" then reduced after the trap. The vent for the toilet can not run horizontal below the flood rim of the fixtures and you can't lay the sanitary tee flat. I'm afraid it wouldn't pass any inspection. You need to vent the tub. Did you see the 2" roof vent that is located very closely to the tub drain, on its way to the main stack? It's within 3 feet of the trap. Is that not close enough? The tub drain including the trap should be 2" then reduced after the trap. I will change that! Thanks! The vent for the toilet can not run horizontal below the flood rim of the fixtures and you can't lay the sanitary tee flat. Would it suffice if I rotated the sanitary tee 45 or 90 degrees upward (so that it faces the ceiling) and then got another matching elbow so that I could continue the direction outlined in my picture? I have a question for you. What is connected to the upstream side of your work? And what was the existing 2" vent for. If it is for a toilet on the upstream side of your work then you can not connect anything between the existing toilet and it's vent. You must connect your work beyond that 2" vent. I'm not 100% sure what's behind that but the main stack is only another five feet from the Main stack so I am guessing that it just goes into the main stack. What I'm asking is what is on the upstream side of your work. Not the side the 2" vent is on. you cant reduce like that, it has to be the same size untill it hits the 3" how else would you auger it should you need to ? and a blockage would occur where it to reduce, once one size it must stay that size or increase.. it seems strange but even the 3" double wye would fail because it increases without means to properly clean out the brancg. shower not vented.. fail code. T used to connect Drainage./ fail code. IF the T was a wye it could vent the toilet provided it be rolled so that the vent outlet be above the horizontal centerline of the 3" branch and equipped with a cleanout to serve it. minimum 2" below flood rim and served by a minimum 2"m cleanout. about the upstream: there is some drainage coming from the upstairs. Those fixtures are separately vented. about the the tub: how would I properly vent this? I don't see how a different caulking is going to fix a venting problem. Hello, i'm excited to report that I made progress on this project. I actually had a master plumber called in who was willing to give me directions in person. I've come a long ways since then and hope to satisfy all the mechanic requirements for this to work. Notice: I haven't actually connected the vent pipe to the existing vent in anticipation of direction/criticism from the users here. I want to thank everyone again for their great help and excellent advise! Please note that codes vary with regions, so what is allowed in one area might not be allowed in another, and vice versa. You are on the right track. Both fixtures are now vented. The problem is that the vent runs horizontal underneath the rim of the fixtures. Both of the 1/4 bends (90 degree fittings) on the vent need to be removed. Use 1/8 bends (45 degree fittings) to turn both vents back up inside of the wall. At least 6" above the rim of the highest fixture tie the vents back into the existing vent stack. I don't know where to start. You can not run a vent horizontally below the flood rim of the fixture. Both the toilet and the tub vent should enter the wall then tie in together at 42" above the floor. The tub drain should drop directly into the trap without the two ell's after the trap. 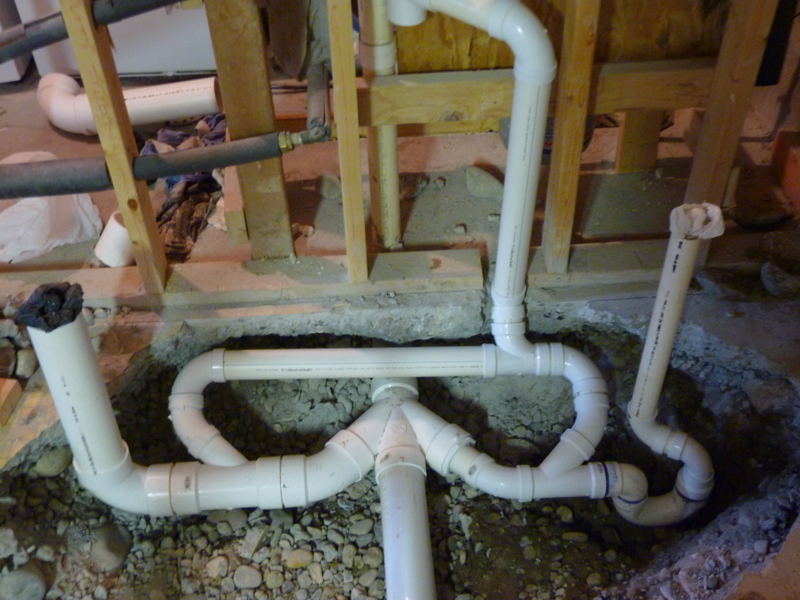 Sorry but I hate to say it the master plumber that gave you direction has no idea how to lay out a plumbing system. Did he actually see the finish product? phishfood , you did it again you beat me by three min. 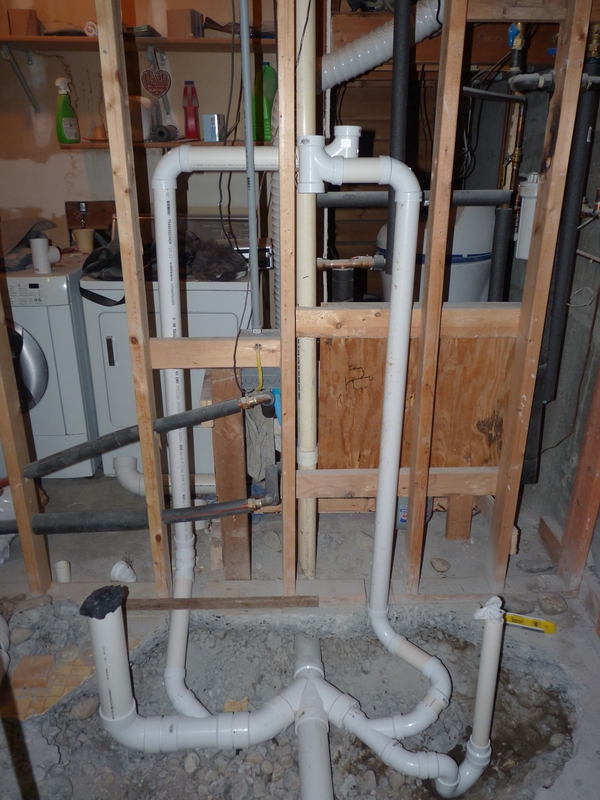 Do you have a opening in your company for the master plumber that designed his system? wow, you guys, thanks for your amazing help. I take this - hopefully final - mistake on me. The master plumber who gave me directions hasn't seen this yet. He probably mentioned the flood rim and I didn't get it. ohh, wow.... you could effectively vent thousands of DFU's .. no joke. Its funny for me to say it but the 90 on the #" horizontal portion of the bathtub vent is technically wrong, though I would be a gazillion dollars it doesnt clog. 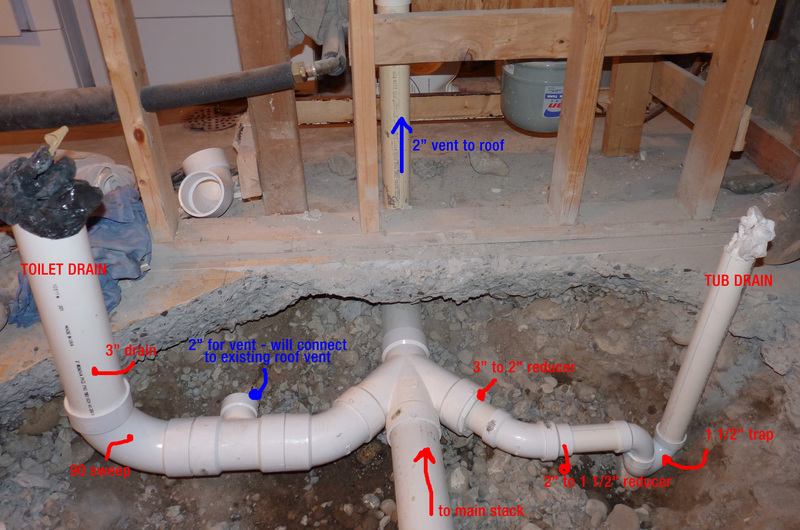 also "technically" you should have access to cleanouts if a vent is below flood rim, It must be piped as though it were a drain, And again.. must come off of the pipe whos trap it serves ABOVE THE HORIZONTAL CENTERLINE which, technically is impossiblle since you used 3" to vent. you could have used 2" to achieve the same. how it is I would consider Trap evaporation my biggest concern... It will work, but is way overkill. Edit:..... hmmm it is 2" isnt it ?? lol, my bad. you're good to go, change out the 90's for 45's add a barett C/o on each vent line and cover them with panels when you finish the wall. I'm excited to be the recipient of good news! This, I have to admit, was beyond me and a frustrating process. But I am glad to not have given up. The two 90's on the tub vent were the only way possible for me to stay within the wall cavity (I am planning on framing a wall parallel to the existing one just for the tub of about 4" thickness). It's not really a horizontal run as its got a significant slope to it. Still, you're saying that I should replace the 90's? they are supposed to be following the drainage rules since they are below flood rim, any 90s must be changed to 2 45's ( this makes the transition smoother and more laminar thus eliminating the chance for clogs ) and should be euiped with line cleanouts to cleanout the sections below flood rim as these could fill and drain and over time become clogged and require cleaning, and they are supposed to come off above the horizontal centerline of the branch piping, this is so that they remain free of water and can properly serve as vents. this is as code stipulates. What are you tying the lavatory into ?? I will add that either of these vent runs could have a lav attached to the vertical by means of a t wye, and that you can run the trap arm of that lavatory a maximum of 6 feet ( if plumbed in 1 1/2 ) and a maximum of 135 ' rotation before it is vented. it looks to be coming along. Know also that the code I speak of is canadian code, and could have variations in your area.. have it inspected, and make sure that you use purple primer and that it is somewhat visablle on the joints as the inspector will be looking for this.